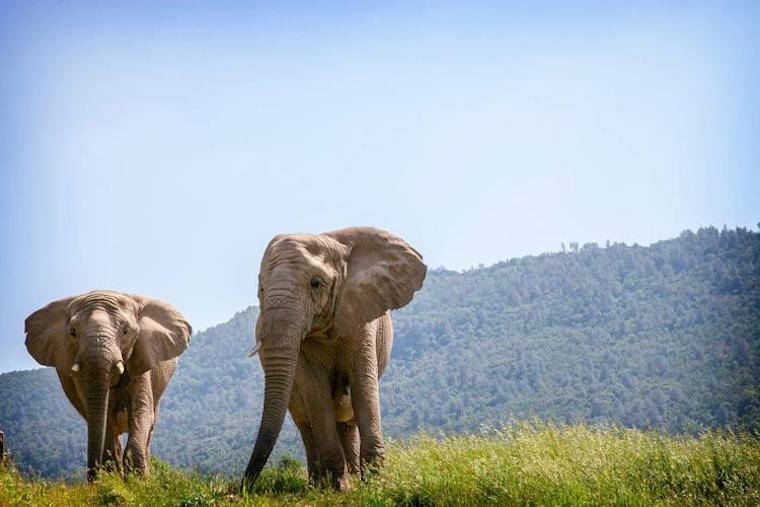 Studies of wild elephants tell us that elephants are naturally active in mind and body for about 20 hours a day; they may sleep about four to five hours a night. This special observation of Mara and Thika reflected those innate patterns. One aspect of my work at PAWS involves conducting observations of our female African elephants as part of an ongoing behavioral study. Usually I work during the day, watching the elephants from a distance for hours at a time and recording their behaviors and interactions. However, I recently had the opportunity to observe elephants Mara and Thika outside overnight. The experience was magical. 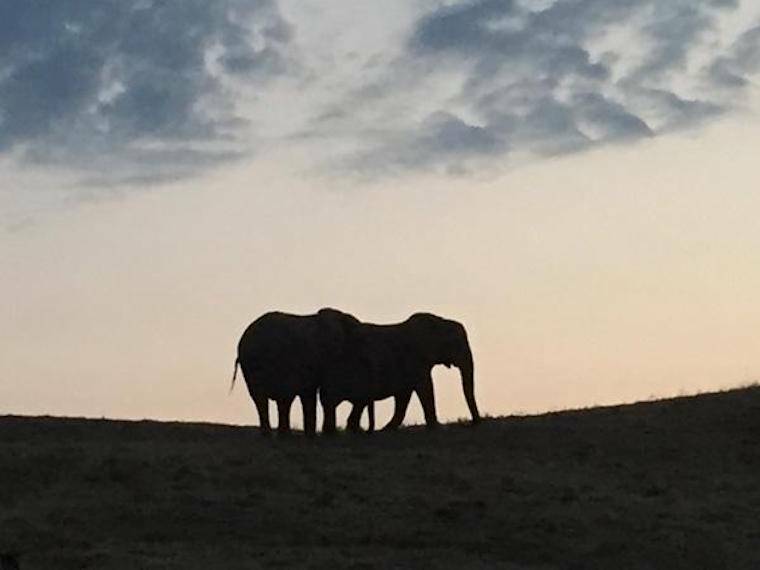 So how do you watch elephants at night? Well, it certainly helped to have a large, bright moon overhead that bathed the sanctuary in a silvery light and illuminated the elephants as they silently crossed their habitat. At one point Mara and Thika climbed a hill together, with the starry night sky as a backdrop. When the elephants were closer to me, they were well defined in the moonlight; once they moved away, they became large, soft shapes, though I could still discern who was who. Sometimes they wandered over the hill and I had to wait for them to come back into view. Mara and Thika spent much of their time doing what elephants do: moving around their habitat foraging for and consuming food. This included hay that caregivers provided for them, as well as natural vegetation. The camaraderie between the two elephants that I’ve observed during daytime hours extended to the nighttime, with Mara and Thika remaining relatively close together as they traversed their expansive habitat. Thika often follows Mara, a behavior I also observed that night. Around 2 a.m. the elephants began bouts of laying down to sleep, sometimes rising and laying back down again. After 3 a.m. the moon set behind the mountains that line one side of the sanctuary and it became much darker. I periodically pointed a quick flashlight beam at the elephants to confirm their behaviors (the light did not seem to bother them at all). The elephants settled in more to sleep. Thika is definitely the more heavy sleeper of the two, slumbering soundly for long stretches of time. (Mara may not have slept as much because she was watching over Thika.) As the sun began to rise the elephants stirred and were met by PAWS President Ed Stewart, who offered them fresh hay. Studies of wild elephants tell us that elephants are naturally active in mind and body for about 20 hours a day; they may sleep about four to five hours a night. This special observation of Mara and Thika reflected those innate patterns. Staying up all night was a challenge, but it was well worth this unique view of the elephants and their environs. There was a captivating beauty to the sanctuary, which was still and quiet except for the sound of chirping crickets and a barn owl calling from a perch in an oak tree. It was a joy to watch the elephants, whose skin took on a beautiful silvery shimmer as they moved through the cool night air. Importantly, this experience adds to our knowledge of the elephants and their behaviors in a sanctuary setting.